allows anyone to use real time, ultra low latency video on existing IP video networks. The world’s premier software-driven IP video technology. Explore unprecedented possibilities for connectivity, creativity, and control with IP—all while using the network infrastructure you have in place today. NDI®, NewTek’s innovative Network Device Interface technology, enables compatible systems, devices, and applications to connect and communicate over IP to share video, audio, and data. Adopted by thousands of companies and readily accessible by millions of people worldwide. NDI® is the most widely adopted and used IP standard in the world and presents compelling new opportunities for video within any environment. Getting started with NDI® is equivalent to adding connected devices to your network at home or the office. But, with applications ranging from effortlessly simple to incredibly sophisticated, the potential for producers and content creators in broadcast, sports, esports, education, business, house of worship, live events, professional A/V, digital signage, and other markets to advance video with NDI® is only limited by imagination. Concerned about the cost of transitioning to IP? Don’t be. NDI® doesn’t require you to invest in expensive facility upgrades, new network infrastructure, or proprietary hardware. High-bandwidth networking is optional, as Gigabit Ethernet network infrastructure can easily accommodate multiple NDI® video, audio, and metadata streams on a shared connection. WiFi is even a possibility with select compatible products. 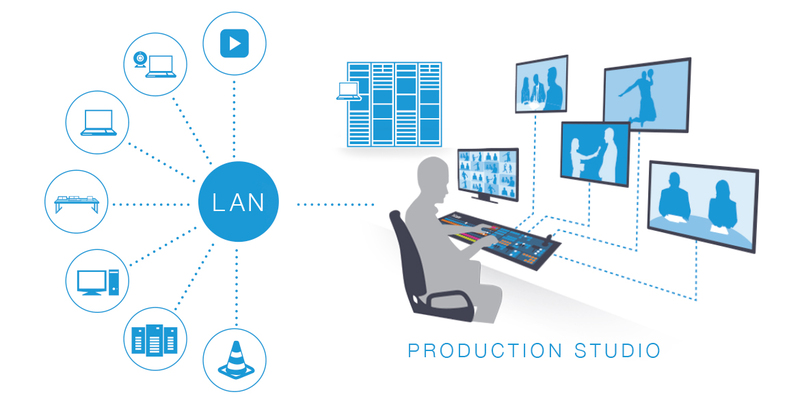 In a single, interconnected production environment, where any device can connect to every other device—and every source is also a destination—the possibilities for live production are limitless. The new era of live production is here. Get started with NDI® today. Build on your existing investments and take full advantage of emerging IP models. With NDI®, you can use any combination of compatible technologies to design a seamless, interconnected production workflow—professional video equipment, cameras, converters, capture cards, playout devices, graphics systems, gaming rigs and consoles, mobile devices, monitors, displays, video walls, video communications applications, creative software, and more. Whether your plans involve transitioning from SDI, migrating to exclusively IP, interoperating with SMPTE ST 2110, or even exploring virtualized production, NDI® allows you to implement the workflow you need for your unique brand of storytelling through video—right now. And with the royalty free SDK, any manufacturer or developer can begin integrating NDI® into their products today and become part of the most prolific IP-based ecosystem in the industry. Start producing and delivering video content over IP immediately. Download this free suite of tools to get started with NDI or expand video opportunities throughout your network. Integrate devices and applications into your workflow, add new content sources, and much more.